Gold Harbour, South Georgia, Antarctica Photographic details: These penguins were all standing in a stream of glacier runoff, as penguin feathers and other lovely things floated by. I wanted to capture how still these penguins can be, with the exception of the occasional turn of the head and a moment to preen their feathers. I sat down with my tripod in the water and wanted to get the slowest shutter speed possible to get the maximum amount of motion blur. This was an easy technical problem to solve, let in as little light as possible by closing down my aperture to f16, decrease sensitivity with an ISO of 50. This gave me an acceptable 6 second exposure. With these settings the water looks smooth and icy as if frozen over with the passing penguin feathers streaking by. 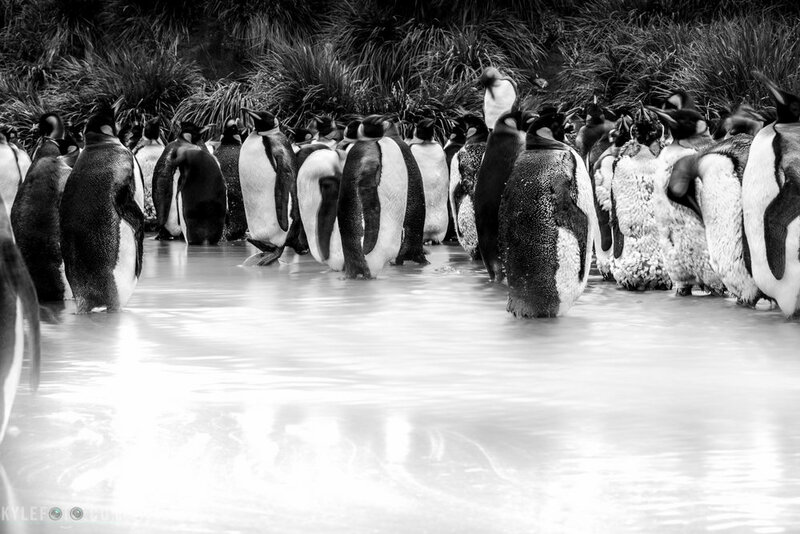 I cropped the image to keep the line of penguins on the top third, emphasizing the strange etherial space that makes up the stream they are resting in. My hope is to express what penguin watching can be like in some areas of the colonies, they may simply stand there and molt, only moving every so often to satisfy an itch, or take a look around. This sky was particularly beautiful. Sometimes it’s not about the extraordinary landscapes that are under my feet, but the canvas of ever changing colour and texture above in the sky. Photographic Details: Shot at the brightest exposure I could allow myself in order to capture the most detail, I also used a circular polarizer. A handy little filter known for darkening the blue sky in order to get the sky to pop. If the sun is in the right direction often the piece of sky 90 degrees perpendicular to it is greatly effected by the polarizer, adding a bit more drama to the image. The best way to visualise which part of the sky will be greatly effected by a polariser is by making a 90 degree angle with your thumb and index finger, like making a pretend gun with your hand. If you keep your thumb pointed directly at the sun at all times, any direction you can then point your index finger will tell you where the sky is mostly effected by the polariser, voila! Your hand is a polarised sky finder! Coburg island, Canadian Arctic These steep cliffs are completely inaccessible for any person on foot and out of reach for any land dwelling animals. For this reason these cliffs make the perfect place for a bird to build a home. Free from the prying eyes and jaws of Arctic fox, Polar bears and anything that could take home an egg as a prize, birds have been nesting in places like this for millions of years. Hundreds of thousands of birds swarm the cliffs, changing the colour of the rock with their guano and filling the air with their calls. Photographic Details: Waiting for a glimpse of sun to come out of the clouds I wanted the cliffs to be highlighted by the light. 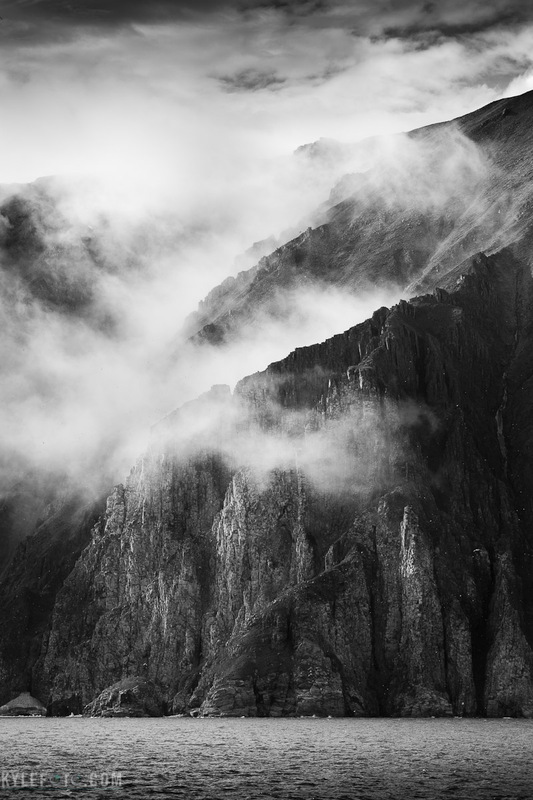 The rare sight of fog on the cliffs adds enormous amounts of texture and depth to the already dramatic scene. Look closely at the image you will see white dots peppering the image, as the sun lit birds show up against the darker shadowy cliffs. 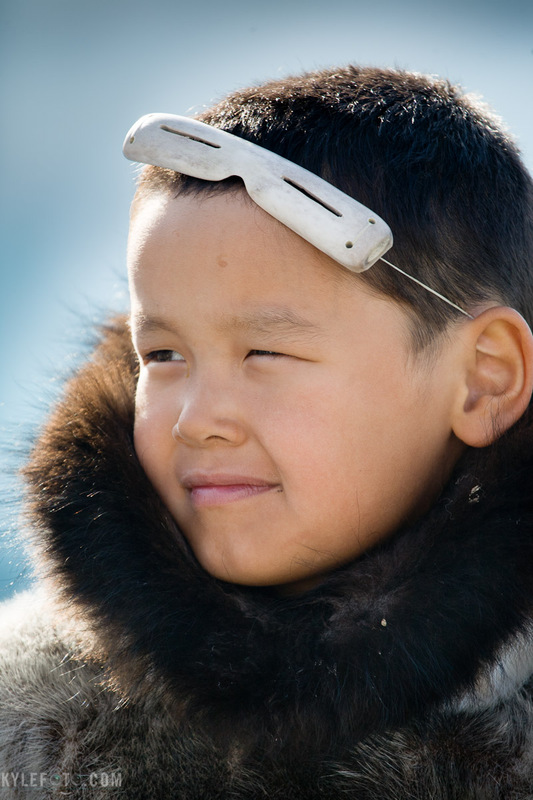 In continuation with one of my other shots here is a more detailed close up of this inuit boy. This has much more details on the bone slit eyewear to prevent snow blindness. A very effective solution to cut out all the radiation in the arctic that I would most definitely use if I wasn’t privy to adequate sunglasses. Exploring the arctic tundra is somewhat of a contemplative activity. Mostly bare rocks will seem uneventful to the inattentive eye, but if you take your time you will become aware of the subtle flora that populates the land. As guides, we establish a perimeter where it’s safe for us to explore, investigating the land for polar bears and keeping armed guides within view of everyone and everything just in case. This group was looking out into the horizon to our expedition vessel, the Akadamik Sergey Vavilov. Photographic details: I noticed how at this moment everything seemed to just fit together. I often use the “rule of thirds” to line my subjects up and this is a great example. I split the image into thirds and my subjects are placed in the intersections of these divisions. The silhouette of the group and the ship are both important parts of the image but they are both 1 third of the way into the image. In addition the sky takes up the top third, the ocean the middle third and the land on the bottom third. The eye has a lot of paths to follow, from one subject to the other. The centre of the image has nothing in it, it forces the viewer to look around and linger a little longer on the photograph. The original full colour photograph was interesting but I wanted more drama, it had a lot more details and I could even see the faces of the silhouettes. In lightroom I shifted to black and white and increased the blacks, this gave me the the contrasty look I wanted. Svalbard, Norwegian Arctic, Ship: Akademik Sergey Vavilov Navigating open water is a great experience, but winding through big pans of sea ice, pushing them out of the way and slicing through other chunks is a past time I will never get tired of. Some chunks bounce off the hull making way for us with a thud, while others split right before our eyes with a very satisfying crunch and scraping sound. Thumps and bonks echo throughout the ship while mild tremors wiggle their way through the hull, making me smile as I watch my green tea on the table tremor with excitement. Having no worries about danger with the adept crew in the bridge and the ice strengthened hull I enjoy a day that is full of these little events as this landscape of little icy continents drift past. Photographic details: Standing up along the wing bridge, I can get a grand view of the ship and the ice below. With an ultra wide 16-35mm lens I can capture a lot in just one view at 16mm. Positioning the bow of the ship as it pokes into the middle of the photo gives it a sense of motion as it travels towards the centre of the image. Having the ship take up less than a quarter of the image helps express the grand view presented in a scene like this. I love seeing the passengers looking out at the ice, they add a human element and help express that travelling in such a desolate looking place doesn’t have to be a lonely affair. I’m not some lone photographer who disappears to the edge of the earth while taking photos in complete isolation to magically appear with great images, I’m a social person and believe me I can’t do what I do completely on my own; everything I do in some part is a team effort. Svalbard, Norwegian Arctic In the hopes of pursuing a polar bear a great place to look is the very platform that bears depend upon for hunting: sea ice. Our vessel being ice strengthened we have very little to worry about when navigating around frozen areas like this. In fact given that we had some time and wanted to scan the horizon for bears, we end up ramming into the sea ice to park the ship, with no need of an anchor we can rest here and take a look at the view. Photographic Details: I was admiring this view when I thought I would have fun with a panorama. Taking multiple photos with my wide angle lens I was able to capture over a 230 degree view, which as a photo tends to play with the mind. It looks like two ships are right beside each other when in reality it’s just the left and right side of the main deck I was standing on. Each photo was automatically stitched together by photoshop after being processes in lightroom. The sea ice in the arctic is usually quite featureless, but after a while it piles up on top of itself into large conglomerates. The tides are still prevalent in the arctic and can ground the sea ice by the shore, revealing interesting features that would normally be underwater. I waited until the kittiwake that was flapping around above me was in the patch of sky exposed, just to give the photo an extra element. Photographic details: Back lighting situations are usually thought of as a disadvantage by photographic enthusiasts, but I have found that more difficult situations provide unique opportunities. Instead of just lighting the surface of the ice, now the light is travelling through it, making it glow! Walking through this little cavern of abandoned sea ice felt like having my own personal fantasy land, as I knew in a short time the tide would come and take it all away, never to be seen exactly like this again. Svalbard, Norwegian Arctic It was a grey day up in the norwegian arctic as we tromped around the snow and rocks in search of arctic enlightenment. It was nice to stretch my legs and explore the contemplative landscape of the north, but I still felt like I was holding my breath, like I was waiting for something to happen. I didn’t know what I was expecting but I was going to be ready for it. As our group walked between a valley towards an old hut the view of the mountains in the distance greeted us. This is when the sky opened up to reveal these beautiful rays of light pouring out of the grey clouds. Everyone just stopped to look in. This is where I was glad to have other people in this photograph. The woman in purple on the right is also taking a picture, further expressing this is a scene worth photographing as her shadow is cast behind her like a spectator of a nuclear explosion. Photographic details: Shot in raw I was able to get all the details I wanted in this scene with one exposure. I had to darken down the brighter portions of the image, and brighten up others to get the photograph to look much more like how I saw it. The magic with shooting and processing in raw with lightroom is that I can correct the mistakes that my camera makes. It’s nowhere near as intelligent and advanced as the human brain and eye; a photograph needs human direction to be a human photograph. Sure it’s nice when a photo comes out looking perfect without a bit of processing, but most of the time an untouched photograph is something that is just done by a robot. I am not a robot. I shot this at f16 to make sure everything is as sharp as can be for this landscape photo. 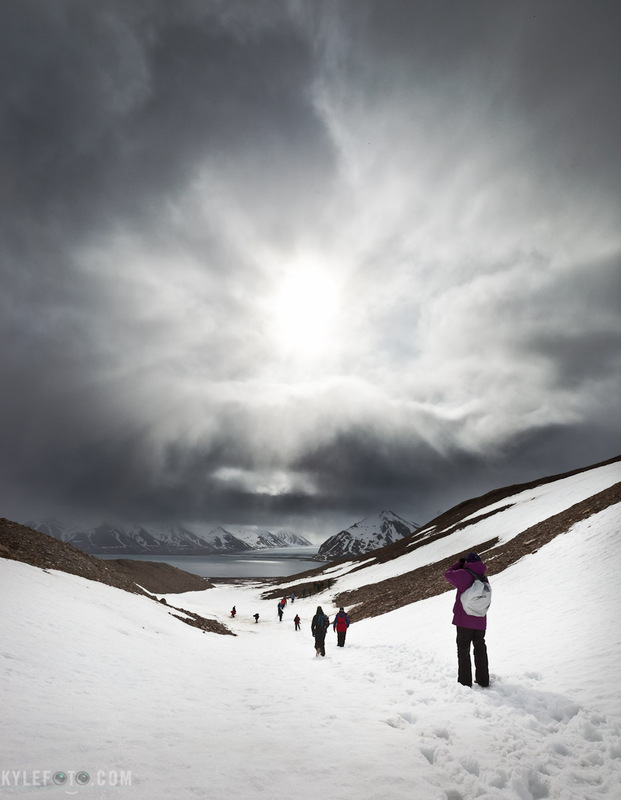 Norwegian Arctic: Svalbard In the winter, the arctic is a veritable snowy world covered in white. And likewise many animals including the Arctic fox has a white coat to blend into their surroundings. In the summer months, the land returns to a brownish red hue, and so does the arctic fox! This little guy was photographed while he was in transition to his summer coat, with a patch of white lingering on his body and tail. Photographic Details: It was such a joy to see such a different style on a fox. This guy popped up out of nowhere and was out of there before I could get a decent close up shot of him. The best I could do was line him up with the rule of thirds and incorporate the background to express that he was in this arctic environment. I kept him on the lower right hand corner to give him room to run into the photo; the white of the snow actually has minute details but I chose to leave them as inconspicuous as they are to make the fox pop out of the frame more. Later in august the sun will start setting below the horizon only to pop up a few hours later. The land of the midnight sun is no longer that and darkness begins to take hold again. The moon was a poignant highlight in the sky this night as we looked across the desolate arctic landscape. Photographic details: Being so dark out I had to use a slow shutter speed of 1/30th of a second. The expanse of this landscape called for a wide angle lens, making the slow shutter speed easier to handle as a tripod was out of the question standing above the vibrating engine room of the ship. Qaanaaq (Thule), Greenland Up in one of the farthest north settlements in Greenland lies the small town of Qaanaaq. Here there is no shortage of bright colours. In addition to the bright housing as seen in the background there is the delicious sight of fresh arctic char hanging to dry. At first I was turned off by this, but when I was invited to try a piece I peeled a cube off and to my delight it was like the most fresh fatty sashimi I had ever had. The look of glee that shone on the wrinkled face of the local man was returned by me as I exclaimed “mmmmm” with a big smile to ensure my gratitude wasn’t lost in translation. West coast of Greenland, 77° North Under way along the calm seas of the arctic, the fractal resonance of the ship’s wake created this beautiful pattern as we made a turn. As an artist would say, this image has “movement”. Your eyes have a lot to do in this image as they start at the bottom left of the image then curve around to the right and up towards the poignant icebergs floating merrily on the surreal horizon off the calm shores of Greenland. Photographic details: I used an aperture of f7 to have a higher depth of field. But I still needed a shutter speed of 1/250 of a second in order to prevent the water from being blurred in too much motion, as I wanted to preserve the texture of the waves.